Time to Carb Load, Runners! For everyone running in the Baltimore Running Festival, congrats! You made it this far, and your just a couple days before the big event. 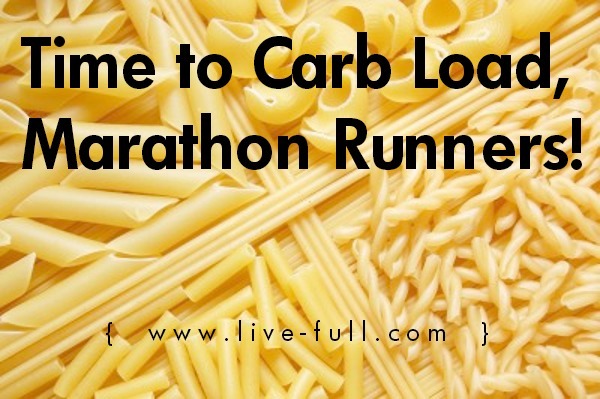 For the runners of the full marathon, I hope you've begun your carb load! Carb loading involves eating lots of carbohydrate-rich foods before an endurance event longer than two hours to load up your muscles with glycogen (aka stored carbohydrates). We can only store a small amount of carbs in our muscles—one to two hours max at hard effort of exercise. We have hours of fat to burn, but using fat for fuel is far less efficient than glycogen, so we need to maximize the carbs stored before we hit the start line by carb loading, eating breakfast on race day and supplementing with carbs on the course, or we risk an...ahem...uncomfortable finish. The carb load doesn’t necessarily require us to eat lots more food. If you over do it by forcing down more calories than you need, you may feel bloated, or you could even be carrying extra poundage to the start line. Instead, think of it as eating about the same amount of calories, but more of it from carbohydrate, with less fat and protein. I approach it by considering meals and snacks I already eat and making adjustments to proportions and ingredients. Example: Instead of my usual oatmeal with tons of seeds and nuts, I enjoy oatmeal with fresh & dried fruit and I add a bit of maple syrup to it. In place of my normal big green salad for lunch, I turn that salad into a wrap and add a side of roasted potatoes. In place of a snack of a banana and peanut butter, I might have banana slices on a piece of toast. Enjoy juice or smoothies in small amounts. Drink 100% real juice and avoid sugar-free like the plague. Do NOT try anything new!!! Avoid highly processed food like chips, snack cakes, etc. Your biggest meal is not the night before your race—it’s the night before the night before. The night before your race, finish your reasonably portioned carb-rich dinner a full 12 hours before your start to allow for proper digestion. And of course on race morning, you'll eat the breakfast that you've practiced throughout your training season. Lauren is a board certified Health Coach who helps busy Baltimoreans tweak their diet and lifestyle to find their healthiest and happiest selves. She studied dietary theory and practical lifestyle management with top experts at the Institute for Integrative Nutrition, and founder her practice Live Full to help men and women articulate their health + wellness goals, and make measurable, sustainable changes for lasting transformation. She works with clients one-on-one and in group settings, including the Wellness Program at Charm City Run Baltimore. Never having played a team sport or run in her youth, Lauren began running as an adult, begrudgingly at first, until she discovered she actually enjoyed it. Now an 8-time marathoner and 2-time ultra-marathoner, you’ll frequently find Lauren running on roads and trails with her husband John and dog Osita.